Bagdogra Airport is located in West Bengal and about 16kms from Siliguri township and is the nearest major airport to visit Darjeeling, Sikkim and Dooars. This small airport has become a gateway to many tourist destinations in North Bengal and Sikkim for both domestic and international passengers. Although the airport can accommodate some five flights at a time, there are no aero-bridges here. So once you land, you will need to walk along the tarmac unless the airline provides a short bus ride. This airport is actually controlled by Indian Airforce but also allows the civilian flights to operate. The airport operates as Indian airforce base because of several international borders that are located nearby including borders with China, Nepal and Bhutan. While road transport is the only means for those making onward travel to Darjeeling area, the Gangtok passengers have an additional option. There are regular helicopter services from Bagdogra airport to Gangtok. As you walk into the arrival lounge, on your left are two conveyor belts where your checked-in luggage will arrive. You will also see a red and a green channel along with an immigration counter. This is meant for tourists from Bhutan. Once you enter the arrival lounge, the toilets are to your right. And straight ahead before the exit and on your right you will notice three tourism counters adjacent to each other - West Bengal Tourism, Gorkhaland Territorial Administration (GTA) Tourism and Sikkim Tourism counters. For Darjeeling, approach the GTA counter for any information about hotels and travel bookings, pocket map, printed pocket guides, literature etc. You can approach the West Bengal Tourism counter for information about other areas in north Bengal such as Dooars. The Sikkim counter provides tourism information and free brochures for the whole of Sikkim including Gangtok. You will see signs for a restaurant upstairs. You can access the restaurant both on arrival and while departing. I always plan to take my lunch here on my way back from Darjeeling to Kolkata. It's a large dining hall with many tables laid out in rows seating four each. My favorite here is grilled fish (usually betki fish) with boiled vegetables. Another favorite is the chicken cutlet - two large pieces served with a portion of French fries. The Indian food including tandoori roti, rice, chicken curry and mutton kasha are also nice. Price is reasonable (a meal for two would cost around Rs. 400 - 500). You get cold drinks and ice creams as well. 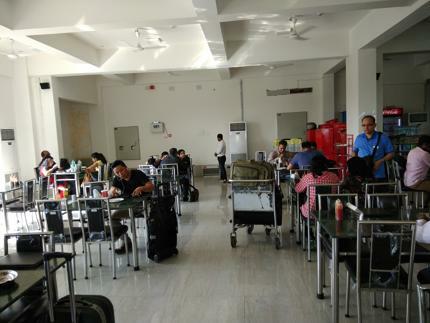 Update October 2017: The location of the Bagdogra Airport Restaurant has changed from its earlier position to another corner in the same floor. Now there is no view of the tarmac although there are windows overlooking some greenery. Earlier you could see flights taking off or landing through the large glass windows. While staff and food menu have remained the same, there is no longer any bar service available here. Earlier alcoholic beverages were available. Upstairs there is also a bookstore, a tea store and a gift & souvenir shop. Effective mid-February 2018, the Bagdogra airport authority would provide free medical services at the airport to those who require medical attention. So far there was only a Medical Inspection Unit which could only provide basic first-aid services to patients. The new free medical services which includes doctor and paramedical staff attending to patients would be extended to passengers as well as airport and airline staffs. Oxygen cylinders are also being provisioned. Over the years there has been practically no expansion of the airport terminal building although number of daily flights operating at the airport has continuously increased and recently there has been a huge surge in passenger traffic. These days it is quite common to see long queues and congestion at the security check-in and departure lounge areas due to lack of space and multiple flights operating at the same time. It is estimated that total passenger count in this financial year will exceed 2 million (20 lakhs) at Bagdogra airport for the first time. Currently there are around 24 flights that operate at Bagodogra airport daily (i.e. land and depart) between 11am to 7pm. Recently Airport Authority of India (AAI) has announced its plan to commission ILS (Instrument Landing System) which will not only help in night landing, but also in reducing flight delays & cancellations in winter and monsoon due to poor visibility and inclement weather. The system is planned to be operational effective March 29, 2018. The groundwork for ILS implementation has already been done over the past one year. The airport runway has been extended to 2,743 meters. Usually a minimum visibility of 1,200m is required at Bagdogra airport for flights to land. However with the strobe lights and ILS commissioned, the flights will require only 350m of visibility to land. With such system in place, AAI expects to operate flights at Bagdogra from 6am to 10pm daily. This will help spreading out the flight timings and reduce passenger congestion at the terminal. There would be sanitary napkins available from dispensing machines at the women toilets of Bagdogra airport. It will cost Rs. 5 per napkin. This facility is expected to be available from beginning of March 2018. 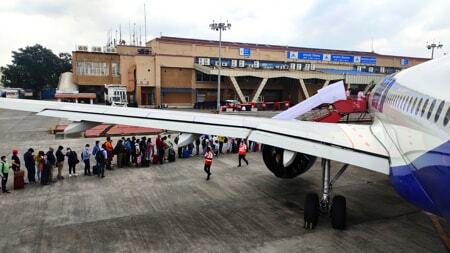 Bagdogra airport currently handles arout 7,000 passengers per day. There is a pre-paid taxi counter at the arrival area near the exit gate. You can get taxis from here to various places in North Bengal and Sikkim including Darjeeling and Gangtok. There are no shared taxis or buses available from Bagdogra airport. The only mode of transport from Bagdogra airport is pre-paid taxis. The pre-paid taxi counter at the airport is usually open till about 7pm (depends on last flight landing). Note: Effective 2017, a group of locals are operating private taxis from both Bagdogra airport as well as NJP railway station to Darjeeling, Gangtok and several other locations which you can only book online in advance. Know about shared taxis from Bagdorga and NJP. Although the taxis are all private cabs, the pre-paid taxi booking counter is presently operated by Siliguri Metropolitan Police who keep track of the taxis. Next to the taxi counters, there is also a currency exchange booth. Inside and on the right of the exit door, there are a series of airline counters, an office of the Assistant Manager and also a small coffee shop. Here you will also find a small booth saying "May I Help You? ", basically an assistance booth for the arriving passengers. As you walk out of the exit gate, you are likely to be circled by the numerous drivers asking you for your destination and offering you rates on their vehicles. TIP: If you want to save money, instead of taking a prepaid taxi you can come out and directly negotiate with the drivers. You can get much lower rates (sometimes half the prepaid rate). So what's the story? The prepaid counter will usually give you a West Bengal state registered taxi, which is a local private taxi (of Siliguri area). The local cab driver then starts negotiating with other drivers outside who have come from Darjeeling, Gangtok and other places to drop their clients and waiting for a return customer. Once the deal is struck (often at half the rate as they have otherwise no choice but to return empty), you will be transferred to the other taxi. So if you come out and negotiate directly with those taxi drivers, you can cut out the brokering local driver, directly strike the deal yourself and get the benefit of lower rates. Another way of saving money would be to group with some fellow passengers who have arrived at the same time, come out and take a taxi together. This way you can further split the cost. In fact, you will often find large vehicles like Sumos outside who take groups. But officially there is no shared jeep/taxi available at Bagdogra airport. If pre-paid is too expensive for you and you find no other option on arrival, then you can take a pre-paid taxi up to Siliguri taxi/bus stand (about 30 minutes). From there you will get buses to Darjeeling & Gangtok (limited number of services per day, so there might be a wait involved), as well as shared taxis/jeeps. While pre-paid taxi from Bagdogra airport is the prescribed transport to your destination, there is a problem with this when you are travelling to Gangtok. A West Bengal registered taxi will be allowed only up to the lower taxi stand (Deorali stand) in Gangtok which is 2kms below the town center. From there you will need to take another local taxi to reach your hotel in Gangtok. But if you happen to get a Sikkim registered taxi, you won't have this problem. Since Bagdogra is part of West Bengal, the men at the taxi counter usually give preference to local (WB registered) taxis. The car park is about 50 yards away from the airport building. If you are travelling to Darjeeling, then check out Bagdogra to Darjeeling to know about the route and the journey to the hill town. 1) Flights to Bagdogra: Information about flights that are operating between various cities of India and Bagdogra, flight timings etc. 5) Visit How to reach Darjeeling for complete information on reaching Darjeeling from various places in India and neighboring countries. Hi, Is there any bus service available from IXB airport to Siliguri bus terminal. If not please let me know the low price option to reach there from airport. Thanks. There is no bus service from Bagdogra to Siliguri. Pre-paid taxi is the main option. You can go out of the arrival hall and try to find a local taxi and negotiate to get a better rate. Sometimes there may be a group travelling through Siliguri and you can join them. Please provide me the contact number of State Tourism authorized agencies who book taxi between Bagdogra to Gangtok for the tourists. There is no state tourism authorized agency taking taxi booking from Bagdogra. There is a pre-paid taxi counter at Bagdogra airport operated by Siliguri Metropolitan Police where you can book a taxi for Gangtok. Hi There, I am visiting India via Bagdogra airport. Is there a money exchange facility inside the airport? I will be carrying US Dollras. Thanks. Hi, yes there is a money exchange counter at the arrival hall and near the pre-paid taxi counter. Hi Raj, Thanks for the complete information provided by you. I am travelling solo from Bagdogra to Darjeeling. What is the best transport medium you suggest as I land around 1pm and need to be at darjeeling before 5pm? Also how safe is it for a girl to travel alone from Bagdogra to Darjeeling? Looking forward for your response. A good option is to take a pre-paid taxi from the counter at airport arrival area (inside the terminal building). Do not take a stray taxi. Another good option is to book a seat online on a luxury shared taxi (operated by WizzRide)... this would be much cheaper and safe at the same time. You can get full information on such shared taxis at this link: Shared taxis from Bagdogra. 1. I am planning to travel to Darjeeling via Siliguri by the Toy train. What is the cost of prepaid taxis from Airport to Siliguri station?And time required to reach the station from airport? Also, the toy train leaves early morning. Are taxis available in those hours? 2. 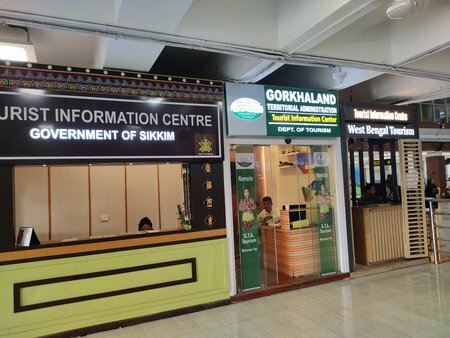 Does the Sikkim Tourism counter at the Bagdogra airport provide information and contact details of travel agents who provide the ILPs for Sikkim? Many Thanks in advance !! Hi, taxi fare from Bagdogra airport to Siliguri would be around Rs. 400. Usually taxis are available when flights land. But most drivers would be unwilling to go a short distance. You need to check at the pre-paid counter. Sikkim Tourism counter can help with permit information. Note that registered travel agents are required to get Protected Area Permits (PAP) and organize a tour to a protected area. ILP is applicable for foreigners and travel agents are not required for that. Hi Raj! I have been going through your suggestions on Darjeeling tour. Thanks a lot helping the new comers. I will be reaching Bagdora airport on 31st evening. Pre-paid taxi looks bit too expensive for 2 of us. What can be other options to reach Central Heritage Resort and Spa? Most importantly, if I avail a shared taxi, will it drop us near the hotel? Or will we have to climb up the hilly road? 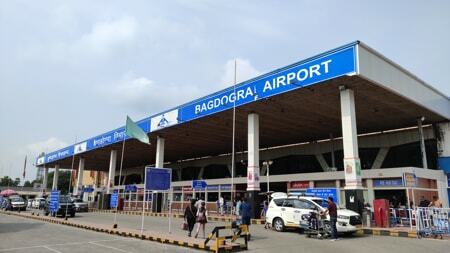 Hi, there are no shared taxis which you can book and avail having landed at Bagdogra airport. However you can now book a shared taxi online (wizzride.com) to get to Darjeeling or Gangtok. There are designated places in Darjeeling (mentioned in their options for drop off points) where you can take a drop. These taxis operate all through the day at regular intervals... so the wait time won't be much. Mr Raj - Hats off to your in-depth knowledge and very practical advice on Darj tourism. You suggest not to take pre-paid taxi from Bagdogra, but negotiate prices directly with taxi drivers. Am travelling on 21 May, Bagdogra - Kalimpong (Morgan House). What would be a fair negotiated taxi fare to arrive at for this leg? Thanks much in advance, and regards. Hello, firstly I don't recommend that instead of taking a pre-paid taxi you go out and directly negotiate. While it is true that you can get a lower fare if you negotiate, the pre-paid taxi drivers after all can be later tracked if required, and that adds to the safety factor. How much you can negotiate depends on the demand... usually I have seen 30-40% reduction is normal, sometimes you might be able to combine your trip with fellow travelers looking to share the cost. Hi, I am reaching at Bagdogra airoprt on 24th. Please let me know for 2 people what's the way to reach Darjeeling through Mirik apart from hiring a total car including fare. Apart from car hire, is there any option to go to Mirik and then Darjeeling (after spending some time beside Mirik Lake). From NJP/ Main bus terminus, is there any AC bus available for Mirik? what would be the cost if I want to get a shared transport and how can I get it? Thanks. Hi, there is no shared taxi at Bagdogra airport (there is an agency that takes online booking for shared cab but not via Mirik). There is no AC bus either from Siliguri. You can take a cab and go down to Siliguri stand and take a shared jeep that goes to Mirik and change over to another one there for Darjeeling. Shared Jeep fare for each sector would be around Rs. 100 per person. Hello, I really appreciate your efforts to respond every query. I just wanted to conifrm if I reach at Bagdogra airport by 4 PM then, can we get public transport (Bus or shared service) to reach Darjeeling. Thanks again. There is no bus or shared taxi from Bagdogra airport. You can take a pre-paid taxi and go to the Siliguri central bus stand where you will get buses and shared taxis for Darjeeling. in Bagdogra? If yes, where do I pick it up from? Self driven Zoomcars are available on rent at Siliguri, not at Bagdogra airport. Their outlet is located on Sevoke road (opposite PC Mittal bus stand and Hotel Tourist Inn). Visit their website for details and contacts. I am planning to visit Darjeeling in April last week. I will be reaching Bagdogra Airport at 5.50pm from Vizag via CCU. Can I get taxi to travel to Darjeeling from airport during these evening/ night hours so that I can reach Darjeeling by 9.30pm on the same day. Yes, you can get a pre-paid taxi at the airport. Hi Raj, Is there an ATM at Bagdogra airport? Hi, there is no ATM at the arrival or departure hall of the airport. However there is one outside near the car park, and several of them about 5 minutes drive from Bagdogra airport (on the main road that connects to Siliguri). Hello, there is no government operated transport between Bagdogra and Darjeeling/Gangtok. All pre-paid taxis are privately operated by the drivers. 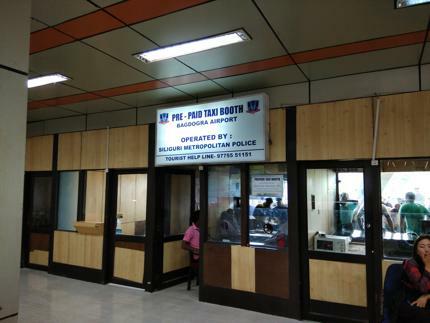 There is a pre-paid taxi booking counter at the arrival hall which is operated by Siliguri Metropolitan Police. All pre-paid taxis in Bagdogra are reserved taxis and do not operate on per person rate. Bagdogra to Darjeeling fare in a small taxi is Rs. 1860. However Govt. buses are available from Siliguri (about 30 mins from Bagdogra) for both Darjeeling and Gangtok. Hi Raj, Thanks for all the insight and genuine information about Darjeeling. I am planning to travel in Dec to Darjeeling and may be carrying big bags which I want to keep at Airport and collect on my return journey. Is there any cloak room/ Lockers available at Bardogra Airport? Hi, there are no cloak room or locker facilities at Bagdogra airport. Hi, We are flying into Bagdogra from Paro. This will be our second entry into India on this trip. We will be visiting Darjeeling. I understand there may be local difficulties at Bagdogra with the e-visa. Would it be better/quicker for us to get a regular visa? Thank you so much. Hi, as per Indian online visa (indianvisaonline.gov.in) website, Bagdogra is one of the 24 designated airports where e-Visa is accepted. 2-times entry is permitted with a valid e-Tourist visa as well as e-Business visa. So, I don't see any problem in your case. Hi Raj and at first a big thank for your information given, this is really helpful. I have a question to the pre booked cab counter in Bagdogra airport: We will arrive at 5:30pm. Will we still get a cab to Darjeeling and how safe is the way during darkness? Kind regards. Hi, you should get pre-paid cab at the counter, however it'll be dark soon and driving in the mountains then won't be fun. I would suggest that you stay overnight at Marina's Motel in Bagdogra and proceed next morning. Is there any bus service between siliguri and bagdogra airport and vice versa? There is no bus service between Siliguri and Bagdogra airport. Reserved taxi is the only option. There is no luggage storage provision at Bagdogra airport. You can send your extra luggage to your hotel in a taxi (preferably in a car sent by the hotel). There is no Government transport like bus service at Bagdogra airport. You can get buses for both Darjeeling and Sikkim at the bus terminals on Hill Cart Road (Siliguri). You need to take a taxi to Siliguri which takes about 30 minutes from Bagdogra. There are also shared taxis at Siliguri that operate on per person rate (Rs. 200 for Darjeeling). Hi! I just want to know that in case I come out from the Bagdogra airport to negotiate with the private taxi for Darjeeling and fails to finalize, is it possible to come back to the prepaid booth? Thanks in advance. Security guards may not initially allow you to get back to the arrival lounge. But show the boarding pass and tell them that you did not notice the pre-paid taxi counter inside, then they would usually let you get in. Respected Mr Raj Bhattacharya, If I want a shared taxi/other car from Bagdogra to Darjeeling, what is the best and cheapest option? When I shall return from Darjeeling where from and what rate I shall get the shared taxi? Thanks and regards. Good day, There is no shared taxi from Bagdogra airport. The only option is pre-paid taxis. You can otherwise come out of the arrival hall and negotiate with drivers to get a better rate, but not recommended. While returning, there is no shared taxi to the airport either. You can however come down to Siliguri by a shared taxi and then take a private taxi to Bagdogra. From Darjeeling, the usual small private taxi fare to Bagdogra is about Rs. 2,500/- (it can be much higher in high season). Hi Raj, your article is very informative and in lucid language. Are there any visiting points near Bagdogra airport to be covered in 3 hours time? while coming from Darjeeling we will reach at Bagdogra airport at 11am, so we'll have lots of time for our flight at 5pm ,so if there are such places we can enjoy them in between? There is nothing much near Bagdogra. You can spend your time at City Center Mall on the main road near Bagdogra. From Darjeeling, come to Bagdogra via Mirik. Hi, Just wanted to know till what time pre-paid cabs are available from Bagdogra to Darjeeling in the evening. Usually until about 7pm. However private cabs that have come to drop passengers are usually available till the last flight arrives. It would be really good if you guide me for a decent budget restaurant which offers good veg. food near by Bagdogra airport or on the way to Darjeeling. I have 6 adults out of which 4 are elderly people and 1 kid of 2 year old. We need budge hotel having decent North Indian/South Indian food. We are coming from Maharashtra, Mumbai. We are planning to get down at Bagdogra by noon traveling from Mumbai very early in the morning, so would like to know the hotel name and address which should be close to airport with decent food quality and within my budget. There are not many veg only restaurants in Bagdogra or on the way. But some restaurants serve vegetarian dishes. You can try the Bagdogra airport restaurant (upstairs) ... which is a multi-cuisine mid-range restaurant and serves some veg dishes. 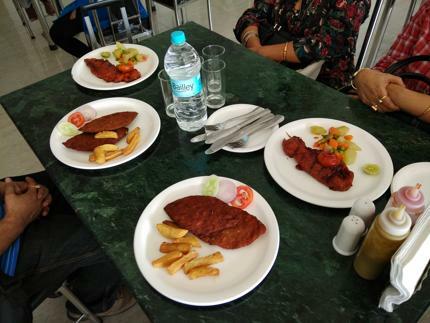 Alternatively you can go to Marina's restaurant (mid range) at Marina's Motel which is about 2.5kms from Bagdogra airport. They serve Indian, Chinese, Tandoori items (both veg and non-veg). Further down (about 1km from Marina's), there is a veg South Indian restaurant (Dyke). Another option is the multi-cuisine restaurant at Kurseong Tourist Lodge run by West Bengal Government. It's about 1hr 45 minutes from Bagdogra and on the way to Darjeeling. Prices are budget/mid-range. You will need to take a taxi. Siliguri bus stand (Tenzing Norgay) is about 16kms from Bagdogra airport. Taxi would cost about Rs. 300. Go out of the arrival hall and talk to the drivers directly. Pre-paid fare is likely to be higher. Hi, There is no Business Class lounge available at Bagdogra airport. However there is wi-fi at the general lounge area. Regards. Are prepaid taxis readily available from the airport? I would imagine asking for a drop to Darjeeling from an operator based in the hills would be impractical and more expensive. But I don't want to take a chance with my parents and thus the question. Pre-paid taxis are available as long as there are flights arriving or departing. No need to get a taxi from Darjeeling which will cost you far more than pre-paid fare.